A flash flood of sports opinions. Evan Turner is an anomaly in many ways. His career thus far has been a disappointment given his college career and second overall selection in the 2010 draft. The Philadelphia 76ers made the playoffs his first two seasons there, pushing the Boston Celtics to a game 7 in the Eastern Conference semi-finals in 2012. He has teased and tantalized with big games and big shots. He’s beaten the Celtics on buzzer beaters and helped the Celtics win on buzzer beaters. He also was served a large hunk of blame pie for the collapse of the Indiana Pacers last season, as the they sputtered towards the playoffs after an unbelievable start. Evan Turner has only been in the league for five years. In his fifth season, and his first as a Celtic, it seems that Turner has (for lack of a better word) turned the corner. He’s not the whiny, lazy kid that 76ers fans pinned to the wall. He’s outgrown the label as the second overall pick, no one cares about that in Boston because Danny Ainge got him at a bargain basement discount. He wasn’t our second pick. Sure, sometimes when he dribbles he looks like a newborn fawn stumbling around trying to find his footing, but he has grown into a role on this team, and he has also grown comfortable filling in for others when they aren’t around. When Rondo returned and Marcus Smart was still settling in, Turner was a solid second option as a ball-handler. When Avery Bradley missed a sloth of games in the winter, Turner stepped in and filled those shoes as best he could. When Isaiah Thomas was injured by Dwayne Wade (not gonna let that one go), Turner stepped in admirably. And when Marcus Smart rolled his ankle in November or when he decided that Matt Bonner should have difficulty having children, Turner took the reigns. Turner has started 45 games and come off the bench 35 times this year. It’s a rare breed that can handle that. Jared Sullinger couldn’t. 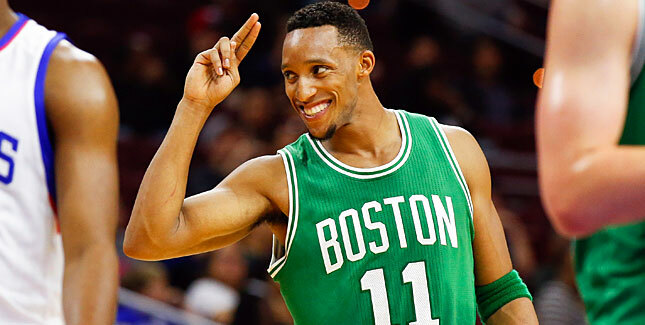 Evan Turner in last 7 games: 15.9 ppg, 5.6 rpg, 7.1 apg. Leading C's in points and assists per game during that stretch with Thomas out. Turner has been durable his entire NBA career, and maybe that’s why he didn’t wash out of the league. Guys who can be penciled in for 75-82 games a year have value. Especially when they are over-sized 2-guards that can handle the ball at the point and defend multiple positions. Now, Turner might have found a home in Boston. He signed a two-year contract in September and I wouldn’t be surprised if he sticks around after that. The question now is, how will Turner fit into this Celtics rebuild as the team improves? In my mind, Turner has turned into a poor man’s Paul Pierce (note: I am NOT saying Evan Turner is Paul Pierce.). Pierce, like Turner, was a stat filler. Pierce scored more points per game, 25.9 in his fifth season in the league than Turner who is currently averaging a Rondo-esque 9.4 PPG. If we look at the per 36 stats, Pierce was scoring twice as many points in his fifth year as Turner, 23.8 to 12.4 per NBA-reference.com. However, Turner is pulling down nearly the same amount of rebounds (6.6 for Turner and 6.7 for Pierce) and Turner is dishing out 2.7 more assists (4.1 to 6.8). Looking more closely at the numbers, Pierce was the primary scorer for the Celtics. His usage rate during that 2002-03 season was the highest of his career at 33.2, but Turner’s usage is 19% this year. Pierce was taking 18.5 shots per 36 minutes on the court (the highest of his career also). Whereas Turner is only taking 11.9 shots a game. Both shot 42% on those attempts. The comparison goes beyond the numbers though. It has to do with the way each of these guys play. They are big guards who are comfortable stepping into the role of point guard. Pierce was a delight to watch run the point when Rondo was hurt, averaging 6.1 assists per game, per NBA.com. In January 2013, Paul Pierce threw up a 17 point, 13 rebound, 10 assist triple double against the Miami Heat in a thrilling double overtime win. It was the first game without Rajon Rondo. On Monday night, Turner dropped a 19 point, 10 rebound, 12 assist performance. Looking through the highlights of both games, there are some stunning similarities in how each of them score and play the game. Obviously, those are three cherry-picked examples of how both guys score. However, I would argue that Turner and Pierce do score in very similar ways. Pierce was just better at it, no one can argue that. One thing that separates Pierce and Turner is 3-point shooting. Turner is a career 32% shooter from long range. Pierce shot 37%. That is a place where Turner can really develop in the next year or two. Working on that three ball will stretch the defense a little bit. As the Celtics continue to build towards the future, Turner could be a big part of it if he’s willing to take on a mini-Paul Pierce role, meaning he plays within himself when the roster is healthy, but it also willing to step into different roles if injuries and suspensions (Mr. Smart….) pop-up. He’s been superb about that this year, and if he continues to fill the box score, remains positive, and improves from behind the arc, Danny Ainge and Brad Stevens just might deserve some praise for finding the right place for Evan Turner when no one thought it was possible. ← Lessons learned from the opening rounds of the NCAA Basketball Tournament.